An up-and-coming singer-songwriter has died aged 22 after suffering from an aggressive form of cancer. Billy Clayton, from Norwich, was diagnosed with Ewing's sarcoma when he was 18 and underwent treatment at Addenbrooke's Hospital in Cambridge. His death was announced by his mother Becky Lawrence who described her son as "one of the most genuinely talented and special people ever". "Billy's music and art will and must live on," she added. "He wants to be celebrated for this and deserves to be known for his talent." Billy had been supported by BBC Introducing in Norfolk and had performed at the Latitude Festival in Suffolk last year on the Inbetweeners stage. 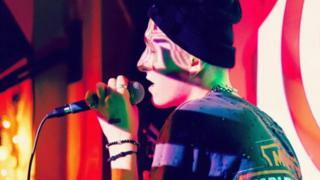 Sophie Little, a presenter of BBC Introducing in Norfolk, said: "We first came across Billy at a showcase he did at Access Creative College and we were impressed by his originality and songwriting. "As we got to know him, it was obvious he was more than just a musical talent - he was a warm and kind person, and highly thought of by everyone around him. "It was always a joy to hear new songs from him." In September, Norfolk band Let's Eat Grandma and Suffolk singer Bessie Turner were among those who performed at the Benefit for Billy gig in Norwich. Mr Clayton, whose music style has been described as electro overlayed with elements of pop and indie, was allowed out of hospital to attend and said he had "much fun". He was finishing his A-levels when he was was diagnosed with the rare bone cancer.